There are many paths to sustained growth in commerce. Organic, community-based growth is the brass ring all brands shoot for. The mythical unicorn of brand building, having a group of dedicated individuals who take the burden of promotion onto their own backs with pleasure has clear perks (*coughfreecough*). But orchestrating the various often ephemeral elements to align to allow for this perfect storm situation is akin to hoping your latest YouTube video goes viral internationally. Although you may try, it’s hard to bank on. But — thankfully! — there are many other paths your ecommerce or multichannel business can take. From leveraging more sophisticated applications and tools, to tying elements more tightly together with great data integration solutions and providers to form a unified and cohesive back-end technology stack, the specific mechanisms to finding and nurturing growth vary but the general categories are well-known. And that’s the case with leveraging acquisitions as a means to growth. Sometimes it makes far more sense to buy the wheel than reinvent it. Brands merge and acquire each other all the time, but the news that reaches our inbox usually pertains to the mega-brands — Walmart and Amazon in particular have been snapping up companies left, right, and center of late. Compared to other methods of growth, acquiring a brand seems like a fairly easy and straight-forward way to build your business no matter the reason for acquisition. But as we’ve seen play out over the past week with luxury brand House of Fraser, acquiring a brand can be a messy ordeal if not planned out and approached properly. In a world where we’ve perhaps become accustomed to apologies from brands and public figures alike, this one stands apart from the crowd. With this singular Tweet that signified the public admission of fault from a one high-standing and respected UK High Street brand, House of Fraser was throwing in the proverbial towel and halting all fulfillment operations. Full stop. You have to imagine that things have to get pretty bad for a multichannel retailer to resort to stopping everything dead in the water until they can figure out the problem ahead of them. A brand that mere months ago was planning on enacting a revolutionary strategy to “become a home for upmarket brands” that already included reducing their number of stores, House of Fraser was a brand primed for acquisition. Luxury fashion has been a sector struggling to redefine itself in the age of decentralized commerce, shifting consumer favour, and the rise of ecommerce, and House of Fraser has felt these pressures in the lead up to this past week’s collapse. House of Fraser, sadly, is just one name among many in the over-saturated “middle” of retailers who are struggling to adjust to changing times. Forced into administration when talks with creditors broke down, by the time House of Fraser was snapped up by Sports Direct the brand was clearly already almost underwater. When it comes to acquisitions, sometimes it goes this way. After all, there has to be a tantalizing reason to purchase any brand, especially one as troubled as House of Fraser. But, of course, things only got worse post-acquisition. With unpaid or shorted suppliers to House of Fraser — brands and fulfillment operations included — piling up, new owner Sports Direct was left with little choice but to suspend operations to buy time to sort the mountains of issues out. Suppliers out-of-pocket are not likely to see their money any time soon, if ever. So the value in House of Fraser isn’t necessarily the brand itself, but the data — and the potential to integrate consumer data widely and more effectively to foster a deeper understanding of how they shop. And it’s this angle that’s intriguing to others looking to acquire brands to foster growth: data integration needs to be a vested consideration in advance of onboarding a new acquisition. Sports Direct’s purchase of House of Fraser was faced with more complex (and very public) issues than most acquisitions, but the end result is always the same: you need a actionable strategy in place on how to fully incorporate the acquisition into your fold. Lawsuits and creditors aside in House of Fraser’s story, Sports Direct and owner Mike Ashley are still faced with both literally and figuratively integrating the purchased brand with the parent brand. Acquiring a brand is a complex process. No where as simple as sign here, congratulations!, you’re the proud owner of Brand X, onboarding an acquisition is a complex process from all angles. Perhaps one of the more important elements for a smooth and hopefully gap-less process is the plan for how to incorporate the new brand into your existing systems. And this has a lot to do with how you structure your back-end technology stack way before you ever get to actually purchasing a brand. We at VL OMNI have seen first-hand what happens when you’re not as adequately prepared as you could be before the moment of merging. A case study that we discuss in-depth in this presentation and accompanying video taken at Shopify’s Toronto Headquarters, we illustrated the importance of choosing the right data integration strategy to maximize your business’ long-term growth. This merchant was selling through multiple channels, including online via their own site and through ecommerce marketplaces, but also in-store through bricks-and-mortar establishments and resellers. With over 10,000 SKUs and growing, keeping the business agile to respond to changes was a core imperative for this merchant. They required specific business rules to be applied to data as it moved between applications, among other considerations. Their integration strategy (before VL OMNI, of course)? : A series of hard-coded static connectors, each created for a specific function at a specific moment in time. Then came the day where the merchant acquired a new brand. While the newly-minted parent merchant’s company had a data integration strategy that worked well enough pre-acquisition, they quickly discovered that their post-acquisition world was far less familiar. Coming with their own applications, the acquired brand needed to have their core systems integrated with the parent brand’s quickly and accurately. And their current data integration strategy did not allow for this. This was clearly illustrated in via three seemingly simple requests. The parent brand wanted to (1) onboard and fully integrate the systems of the newly acquired brand into the parent company’s systems, (2) they needed their business rules applied directly to these new integrations, and (3) they required a change in ship method in their integrations. Because they had chosen custom hard-coded integrations to move their data between applications, these three items ended up presenting a serious challenge to the parent brand. The custom, hard-coded nature of the integrations meant that there was no easy, fast, and cost-effective way to ‘edit’ the integrations to accommodate these needs. Changing the ship method required a complete rebuild of the affected workflows, applying business rules was a rigid and fixed process instead of allowing for the agility and responsiveness the brand required to function, and onboarding the newly acquired brand meant, again, building all new data integration workflows from scratch. The entire process would have taken weeks if not months to complete, and would have been expensive — in this scenario, you’re essentially paying a programmer to sit and re-do everything. Not exactly the agile and responsive process the parent brand had thought they had in hand with their custom hard-coded integrations. Luckily for this merchant, they thought better of throwing more money after bad and decided instead to revisit their data integration strategy. Eventually partnering with VL OMNI for an agile, scalable iPaaS solution, their new data integration strategy made a world of difference in their existing processes and in bringing the newly acquired brand fully into the fold. With VL OMNI’s solution quickly put in place, the merchant was able to integrate the new brand and their systems into their existing ones by simply having VL OMNI duplicate existing application-specific workflows. Changing the ship method was as simple as changing a few parameters, and only took the experts at VL OMNI about 20 minutes to complete. Applying business rules to any and all data transformations part of the integrated system now exists ‘outside’ of the Connector in a business rules logic engine, making these business rules easily configurable over time without disrupting (or dismantling) the actual integration connection. custom-coded data integration strategyversus VL OMNI’s agile and scalable solution. Their data integration strategy had huge implications on their scalability and agility. 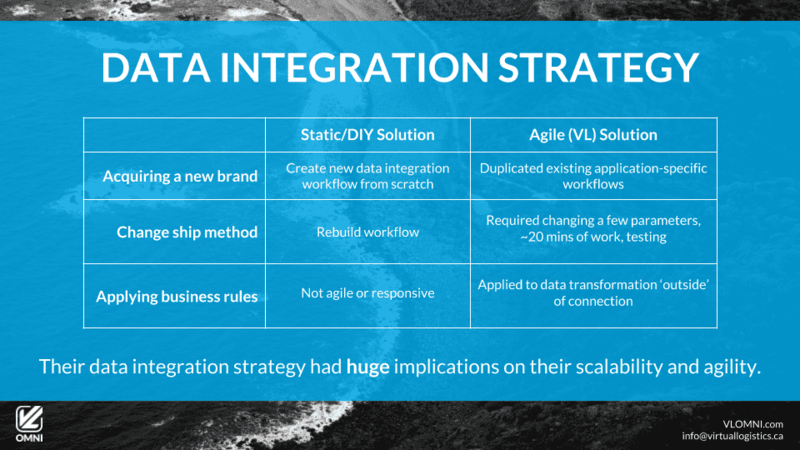 Your data integration strategy should boil down to this: your integrations shouldn’t dictate how you run your business, your business should inform your integrations. It all comes down to agility; how fast your technology allows your brand to act, react, and adjust to every and anything. Those who are able to move quickly will reap the rewards, and those who do or can not should eye the House of Fraser tale with a good deal of caution.